I'm feeling fat, so I think it's time to go on a diet. Not literally. I feel I've made great progress over the past several months in my eating habits, but with my consumption of food under much greater control, it's becoming time to take the reins and get my information consumption under control. Apparently, we now live in the information age, and each day there is an overwhelming amount to consume. It is becoming clear that I need work on developing a healthy information diet. I have a tendency to go through cycles where I binge on the Internet, and then try to cut back drastically. It doesn't seems to be the most effective method constantly flip flopping between reading and looking at everything in sight and trying to radically reduce my inbox and RSS feed subscriptions. I'm thinking now I need to find a better and more sustainable balance between the extremes of binging and anorexia. Where this will lead is the big question: What is information for? First, this doesn't have to be unpleasant. I'm not prepared to come out and advocate for myself or you a low information diet. This is partly because of how much I enjoy most of what I read and watch, but also because I think a lot of the information I consume does have its place in my day and value for me. 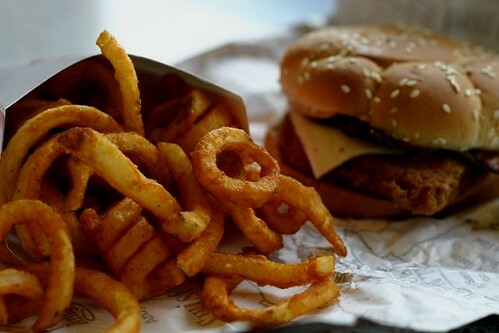 However, there is also the fries and burgers of my daily dose that I can probably do without. I have no plans to ever give up burger and fries completely, but they work well for the point I'm illustrating. Some foods are not as good for you as others. Finding the good ones that agree with you and denying yourself the pleasures of the others is difficult but possible. To be healthy, it is not necessary to outlaw the good tasting foods that are bad for you. It is over the top to only select fat free, low carb, low sodium, high fiber fare for each meal, but developing a healthy balance is just the ticket. There really is no clean cut answer as to how much information is the right amount of information. Again, this is very similar to any diet of food. The correct amount of information to consume depends entirely on the situation and the individuals' desired outcomes. Michael Phelps has to consume thousands of calories per day while in training to be able to perform as he does. Models, such as Filippa Hamilton, don't have the same luxury. They are after something else entirely. I'm sure the editors at Lifehacker have to have a very different level of information consumption to produce their massive site of useful information than that Leo Babauta needs to write his insightful posts for Mnmlist. The input for both of these examples is, I'm sure, in direct proportion to the desired output. One is not superior to the other. They are just different and are tailored to meet the specific needs. The most important thing to find in developing a healthy information diet is the right balance. Information consumption is no different than eating in this respect. Everything that goes in must come in and be digested. Then, it will either be used or discarded. The correct balance is entirely dependent upon what you want to do with the information. If you're a writer, you'll want to consume everything you can about your subject so that you can write on it competently. If you're an athlete, you'll want to know about your sport so you can find your edge. Consuming too much information without proper digestion will lead to indigestion or waste. Neither is good. 1. Input: This is everything you read, see, watch, or listen to. This can be controlled by deciding what books you read, what shows you watch, which RSS feeds you subscribe to, and the music you listen to. This is also the part we only have partial control of. There are thousands of voices fighting for our attention each day. It is impossible to tune in to them all. It is also impossible to tune them all out. But it is possible to filter and highlight the things you want while blocking what you don't. 2. Reflection: This is the step where you digest everything that comes in. This can include a song getting stuck in you head, a topic that inspired another idea or project or the simple enjoyment of remembering what you watched or read. It doesn't have to be anything too deep. This stage of reflection is just the internalizing of what came in your mind. 3. Output: This is the final component of a balanced information diet. Everything that goes in will come out one way or the other. There is three possibilities in this stage. It can either come out in a productive and enriching way, go to your thighs, or it can simply be forgotten and wasted. Athletes use the food they eat to drive their performance. Couch potatoes don't, and the end results are visible. Some information can also just be forgotten and lost forever. Hopefully it was enjoyable the first time around, other it was kind of pointless. Since everything that comes in will eventually come out, it is important to remember that you are what you eat. The information that you consume becomes a part of you. This can make you better or it can make you worse, depending on what you let in and how you use it. Know what you are trying to achieve. Decide what you need to know to achieve it, and ignore the rest. Learn to determine how to best use the information you receive. Adequately reflect on the information before acting on it. A healthy information diet does not have to be austere and boring. Some of what we eat can still be just for fun: a bowl of ice cream, a scoop of cookie dough. It's the same thing with an information diet. It can be for it's own sake, but too much will make you fat.